Local author, Michael J. Maddigan will be speaking on his recent book “MCI-Bridgewater: A Troubled Past” at the Bridgewater Public Library on Tuesday, May 22nd at 6:30 p.m.
Once known as MCI-Bridgewater and earlier as the Massachusetts State Farm, the Bridgewater Correctional Complex opened in 1854. It was one of several progressive charitable institutions the state created as a model for communities around the world. 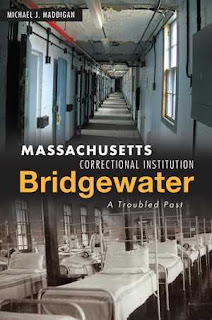 However, deteriorating conditions for its residents shadowed Bridgewater's evolution from an almshouse to a prison and hospital for the criminally insane. A century later, it was among the nation's most notorious asylums. Historian Michael J. Maddigan offers a riveting examination of this infamous history, including the inspiration for state-sponsored welfare, moral and legal challenges and the experiences of the people who lived and worked there. Books will be available to purchase and will include a signing.